Zum Kauf und einfach mal zum ansehen: TR707 mit Modifikation. Nice Mod on the TR707 also to buy on the Forum. don’t ask me, it’s not mine! 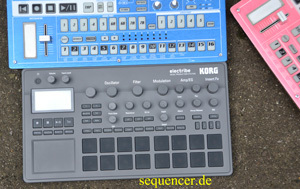 was ist die / what the hell is the TR707? 1 OSCs sync ring fm formant comb noise rom samples waveshape additive, 1 LFOs, 1 EGs, 1 FILTERs (4pole), TR sequencer, arpeggiator more..